The Jang News website is one that just keeps getting worse with each passing day. When I wrote a review of Dawn.com Beta website launch, I highlighted their technical and interface shortcomings but the Jang News’ website is not worthy of even that. It’s lacklustre and shows absolutely no concern for its readers or the news that it serves. The website is a big hoarding with no less than 20 advertisements on the front page while at the same time carries less than 100 words of actual news. And it looks really ugly. This is what happens when you just don’t care about the readers. This is what happens when designers develop, developers design, business units dictate the roadmap and talent in general lacks. This is also what happens when you just don’t understand interaction design, information architecture, usability or have been oblivious to the paradigm shifts in online advertising and technological trends. 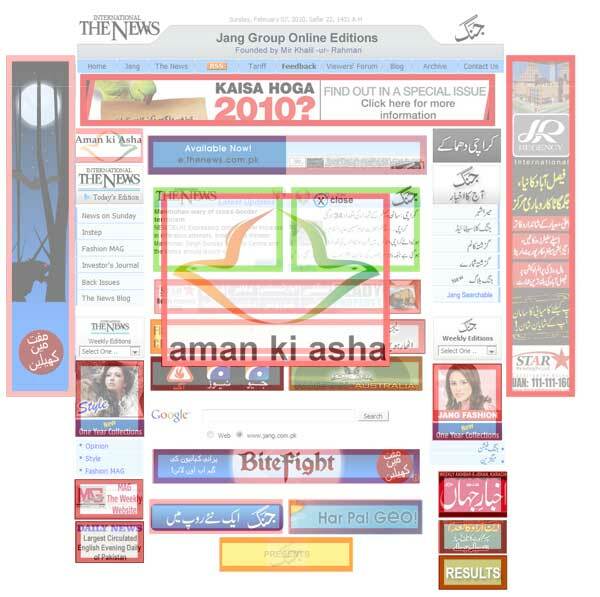 This screen capture of the Jang News website clearly highlights all this. The actual news content is highlighted in green boxes while the rest of the page is mostly advertisements. All ad slots highlighted in red are available for sale while unsold ad space is used for in-house products. The advertising tariffs section of the website indicates the type of ads available for sale on Jang News Online which includes video and expandable ads at a premium. The annoying expandable ads block access to the news until readers close them (shown in the screen capture) while video ads block the rest of the page because they take so long to load (Pakistan has very low broadband penetration in any case). Jang News Online gets a considerable amount of traffic because the Jang News Group has entrenched itself as the face of news over the past 70 years that it has been around–a time during which it enjoyed little or no competition which helps explain their complacency. Now, I am not even sure why an advertiser would want to publish one ad amongst 20 when it’s well known that users develop banner blindness and moreover the website’s ad space is extremely diluted and the screen interface is so cluttered. The page reminds me of the days popup ads ran rampant until readers expressed rage and all major browsers (Internet Explorer, Firefox, Safari, et al) reacted by featuring popup blockers to put an end to it all. Unfortunately, in Jang’s case it’s not easy to block the spam. The website’s front page is practically an online hoarding which seems to take it’s cue from the million dollar homepage (whose sole purpose is to show advertisements) rather than a news site. One may easily pass this off as spam in its current state. Thanks Caroline. Good luck with the launch! I was planning on reviewing Jang and few other newspaper websites in Pakistan. The problem is that they actually don’t care about their readers. There is no “plan” on making website as a revenue source, rather it is treated as an extra “good-to-have” income. I think ppl visit taza tareen page more than there home page. there main content is on taza tareen page… i directly go on tazatareen page page and always get the latest news there, may be you forget to visit this page…. Good point Muzaffar. Good design is just common sense isn’t it? Instead of visiting jang.com.pk you now just visit jang.com.pk/jang because the front page is useless. That is exactly my point. But you found a good way to avoid the front page altogether and I am sure others will appreciate the suggestion. I wish avoiding junk on TV were just as easy. But it begs the question: what is the point of having a front page in the first place if all readers are skipping it? It defies all common sense. I would not enjoy my morning newspaper if its front page was full of ads and the actual news was on the second page. Jang’s front page is even worse. A good bit of my time and bandwidth are wasted on loading a really big multimedia page full of ads. But what’s worse is that there is no easy way to bookmark the Taza Tareen page either. This is because http://jang.com.pk/jang redirects to http://jang.com.pk/jang/mar2010-daily/11-03-2010/index.html which makes no sense in bookmarking. If you could have a look at their Google Analytics, I am certain you would notice that most people end up coming to jang.com.pk and then click on through to the next page. How annoying for the poor readers! The inside pages of the Jang website are also rife with their own set of problems but that criticism is for another day. I came here via your Custom Google Search Plug-in. I read some of your writings. Excellent. I am from Tamilnadu State, India and I am a subscribed reader of the website http://www.nakkheeeran.com/. If anyone visited this website will see a face on the top right corner with really big mustache is the Editor of this website and weekly magazine. Initially he started Magazine and now his website is one of the big online news site in our state. There they placed 6 advertisement on the front page which in never distracting a visitor. Also they have subscription only news category placed at the bottom of the website. They are charging annual subscription charges which is ver affordable to a common man. Maybe this Jang news website is not serious about making real money. By looking at the advertiser, advertisements and the way they placed it on the website, they could not make any big money on advertisements without visitor movement. Loading Stats: 42 queries. 0.104 seconds.